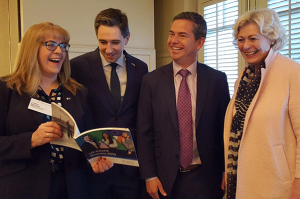 (From left) Carin Bryans of AmCham Ireland shows the U.S.-Ireland Business 2019 report to Irish Minister for Health Simon Harris; Mark Jansen, president/CEO of Blue Diamond Growers and CalChamber Council for International Trade chair; and Susanne T. Stirling, CalChamber vice president, international affairs. 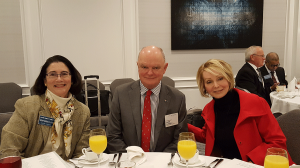 (March 19, 2019) The strong trade and investment links between Ireland and the United States, as well as California, were celebrated last week at a California Chamber of Commerce breakfast held in conjunction with CalChamber Board events. (From left) Mark Jansen, Blue Diamond Growers, chair, CalChamber Council for International Trade (CCIT); CCIT member Susan Corrales-Diaz, Systems Integrated; Walter van der Weiden, Consulate General of the Netherlands; and Gerbert Kunst, Consul General of the Netherlands. 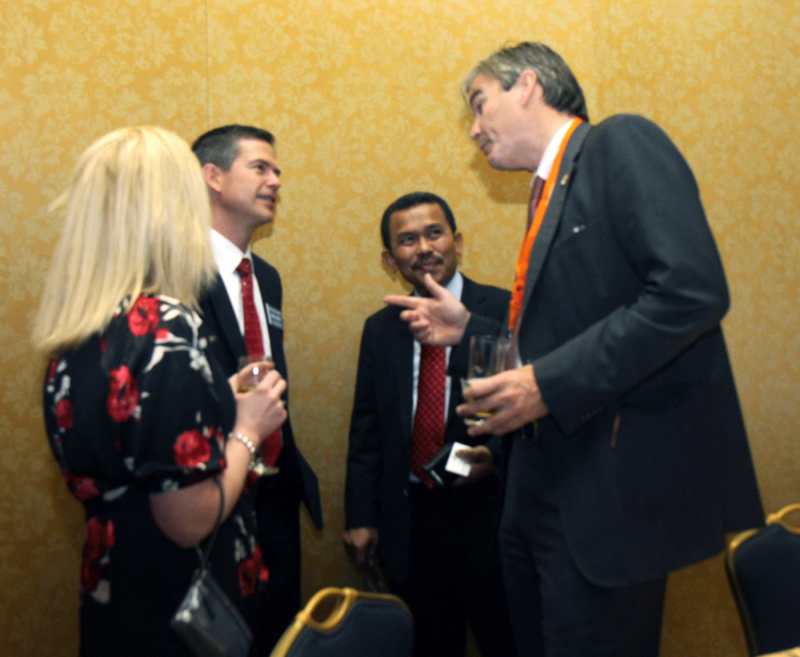 The Netherlands looks ahead to changing trade relations in Europe as the United Kingdom is leaving the European Union, the Dutch Consul General explained to a California Chamber of Commerce gathering last week. Brexit is anticipated to have a negative effect on the economy, as the Netherlands and the UK have historically strong trade relations. However, it also presents opportunities to Dutch businesses as they will have certain advantages over their UK competitors that will no longer be part of the EU. 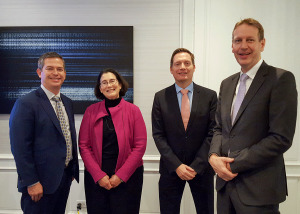 The European Medicines Agency, comparable to the U.S. Food and Drug Administration, will be relocating from London to Amsterdam in 2019, along with nearly 20,000 jobs. Certain international companies in the UK are considering moving to mainland Europe, and the European Banking Authority will be relocating from London to Paris. 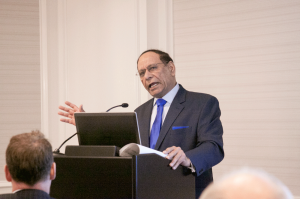 (September 7, 2018) In an era where “trade is invading every zone,” increased tariffs on imports are the wrong way to generate prosperity for U.S. businesses, a trade policy expert told a California Chamber of Commerce gathering last week. John Murphy, senior vice president of international policy for the U.S. Chamber of Commerce, emphasized that the rest of the world is moving forward in areas where the United States has stepped back from trade talks. 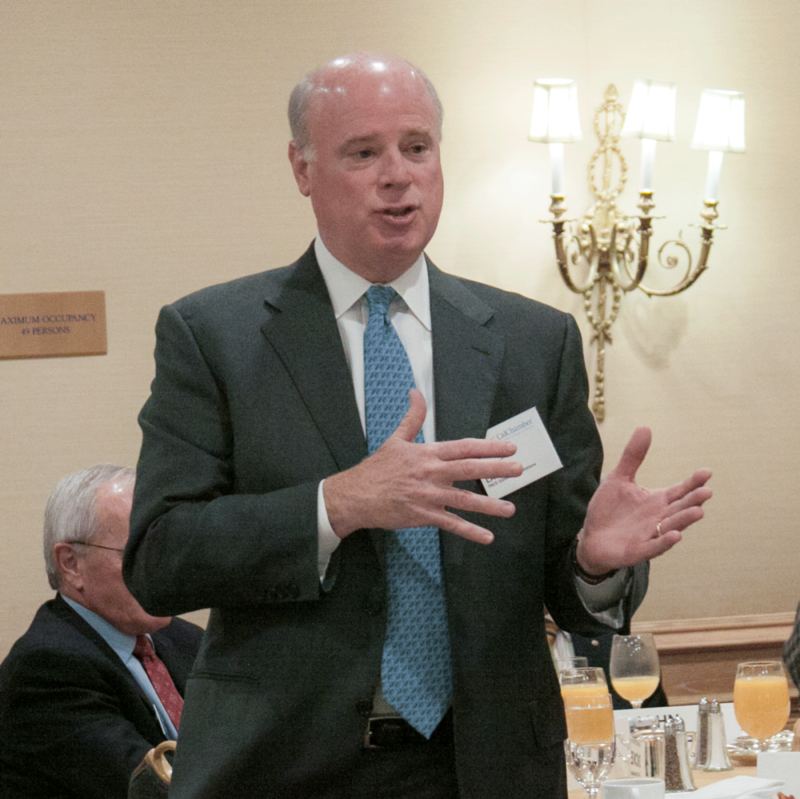 If the United States doesn’t get back to working on opening markets to American goods and services, “we’re going to be on the outside looking in,” Murphy said at the September 7 international breakfast of the CalChamber Council for International Trade. 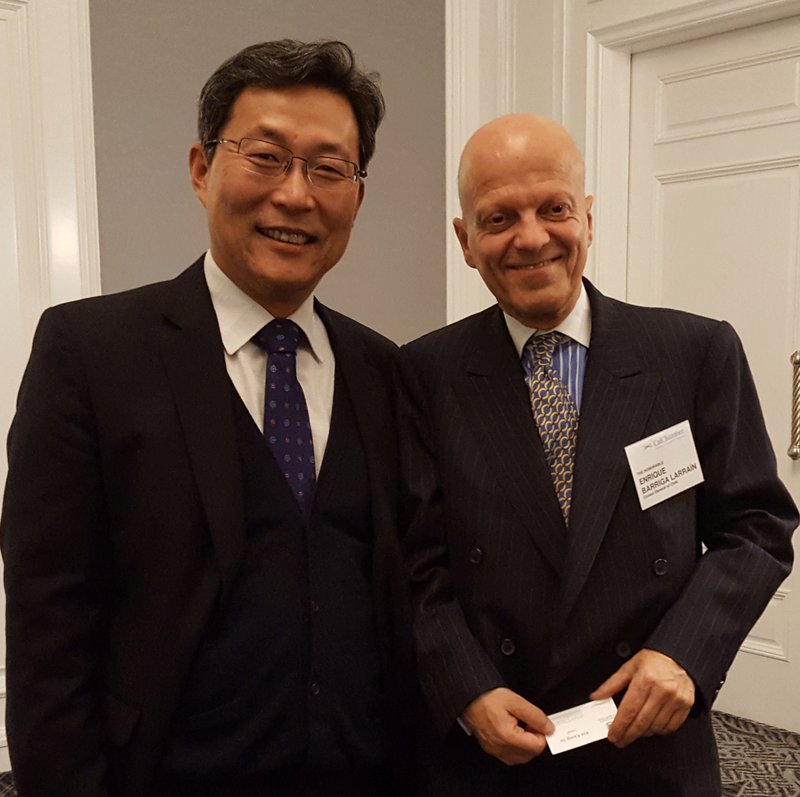 (May 29, 2018) U.S. and California politics and trade priorities, global connections and the importance of exports were the topics discussed by an international trade expert, a veteran political columnist and an economist at the recent international forum presented by the California Chamber of Commerce. 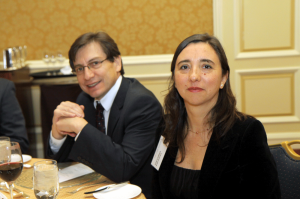 (March 2, 2018) The campaign to be the next President of Mexico could be a close one, the director of the Center for U.S.-Mexican Studies at the University of California, San Diego told a California Chamber of Commerce breakfast audience last week. 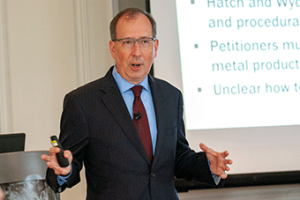 “So far, it seems that this is going to be a very competitive election,” Professor Rafael Fernández de Castro said at the March 2 international breakfast meeting sponsored by Blue Diamond Growers. 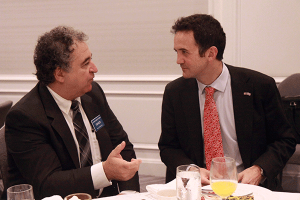 Thomas J. Rizzo (left), general manager of the Martinez Refinery for Shell Oil Products U.S., speaks with British Consul General Andrew Whittaker at the CalChamber International Breakfast on December 8. (December 8, 2017) Leaving the European Union is not about the United Kingdom cutting itself off from the rest of the world, British Consul General Andrew Whittaker emphasized last week in remarks to a California Chamber of Commerce audience. 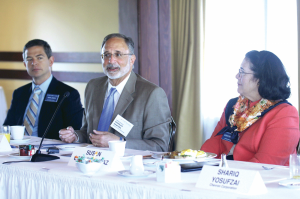 The meeting was sponsored by Shell Martinez Refinery, whose general manager, Thomas J. Rizzo, is a CalChamber Board member. 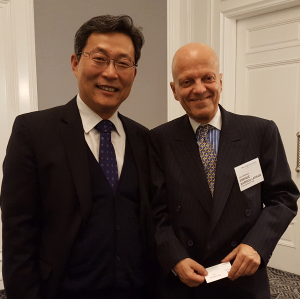 (September 8, 2017) The North American Free Trade Agreement (NAFTA) is at the center of the nation’s future economic competitiveness and national security, an international strategist told a California Chamber of Commerce audience last week. NAFTA has turned the United States, Mexico and Canada into a manufacturing powerhouse, Michael C. Camuñez, president and CEO of Monarch Global Strategies, said at the CalChamber international breakfast on September 8. The importance of trade and the ability of U.S. and California companies to compete more effectively in foreign markets was the topic discussed by three international trade exports at a recent international forum at the California Chamber of Commerce. 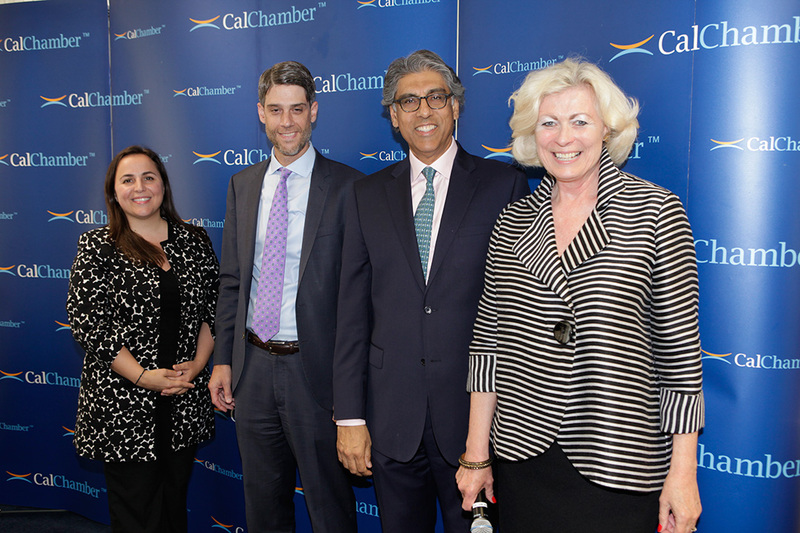 Featured speakers at the May 31, 2017 International Forum presented by the CalChamber Council for International Trade. CalChamber Reiterates Trade Priorities for New Administration, Congress, January 24, 2017. 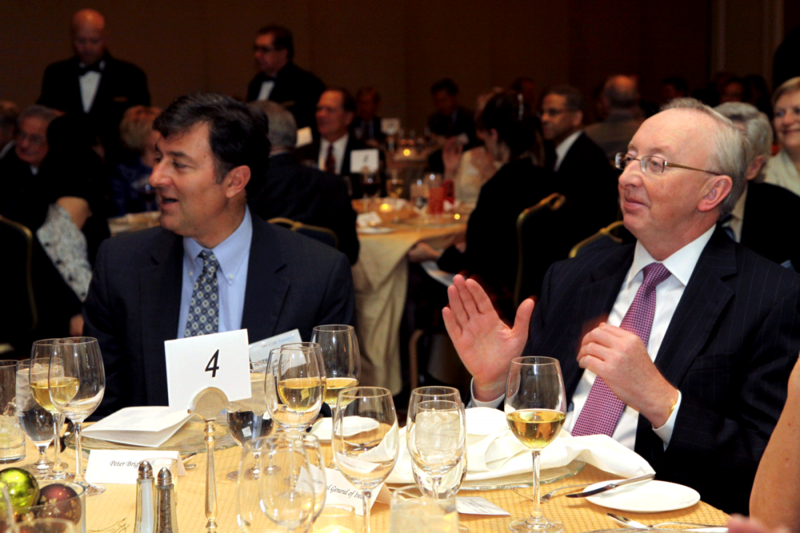 Myron Brilliant, executive vice president and head of international affairs at the U.S. Chamber of Commerce, explains at the CalChamber Board of Directors dinner on March 2 how various U.S. trading partners have been reacting to presidential actions and statements in the early days of the Trump administration. 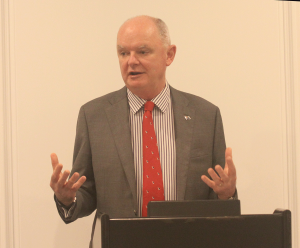 (December 9, 2016) Australian Consul General Chris Oldfield gives an overview of trans-Pacific trade issues and the longstanding close ties between the United States and Australia at a CalChamber international breakfast meeting sponsored by CalChamber Board member Diane Miller Miller of Wilcox, Miller & Nelson. 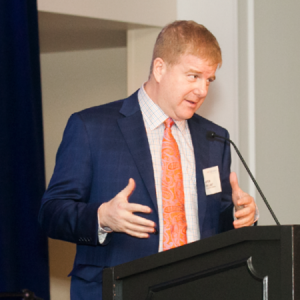 Breakfast attendees also heard from Brian Peck, deputy director of international affairs and business development at the Governor’s Office of Business and Economic Development (GO-Biz). 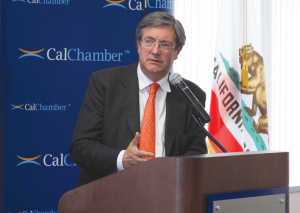 (September 9, 2016) Europe’s importance to both the United States and California was the focus of a recent California Chamber of Commerce international breakfast. 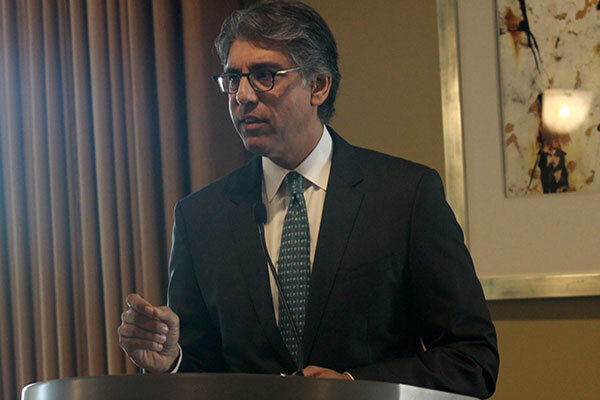 (March 4, 2016) Observations on conditions affecting companies doing business in Latin America were presented at a recent California Chamber of Commerce breakfast gathering by Ambassador Jamal Khokhar, president and CEO of the Institute of the Americas. 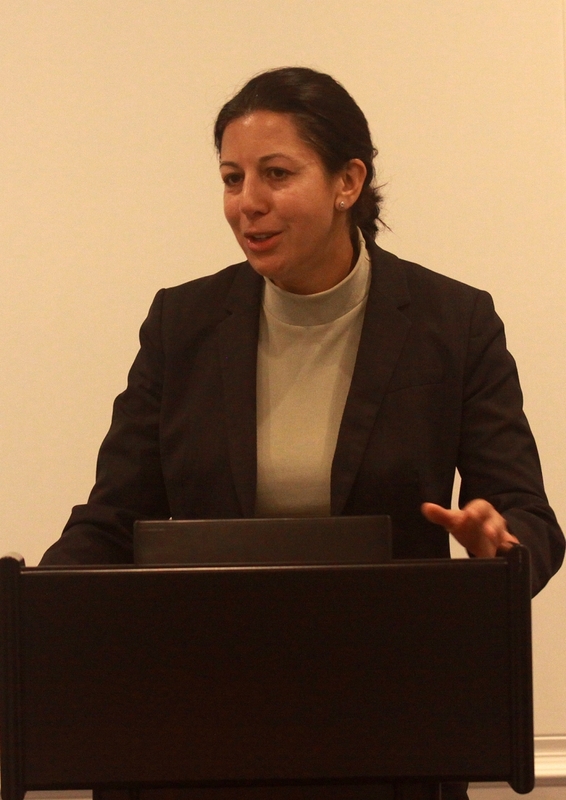 The March 4 talk and question-and-answer session covered topics ranging from the economy of Brazil, to the importance of trade to the three North American Free Trade Agreement markets and the dynamic potential that Argentina represents under the new government of President Mauricio Macri. 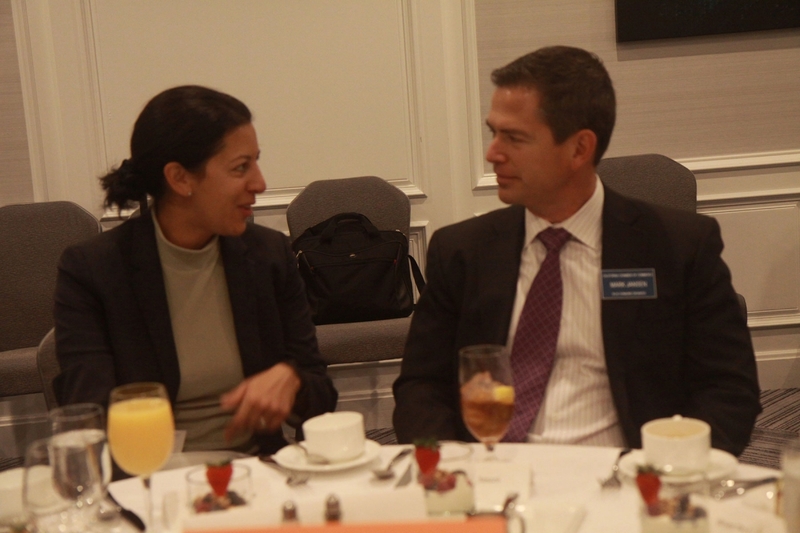 (December 4, 2015) CalChamber Council for International Trade hosts International Breakfast Friday, December 4, featuring British Consul General Priya Guha and GO-Biz Deputy Director of International Affairs Brian Peck. Consul General Guha provided insight on California relations with the U.K. and Europe, as well as information about the Transatlantic Trade and Investment Partnership (T-TIP). 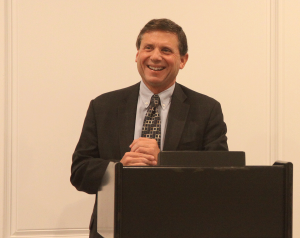 Brian Peck gave a brief update on the international activities of GO-Biz. (September 4, 2015) California and other U.S. real estate markets are likely to see an intensification of upward trends in Chinese investment due to the recent turmoil in China stock markets, a longtime Asia expert predicted at a breakfast gathering hosted by the California Chamber of Commerce Council for International Trade. The stock market losses suffered will likely cause Chinese citizens with money to invest to diversify their portfolios into locations such as the United States and Canada, said Dr. Bruce Pickering, vice president of global programs and executive director of Northern California for the Asia Society, at the September 4 breakfast. 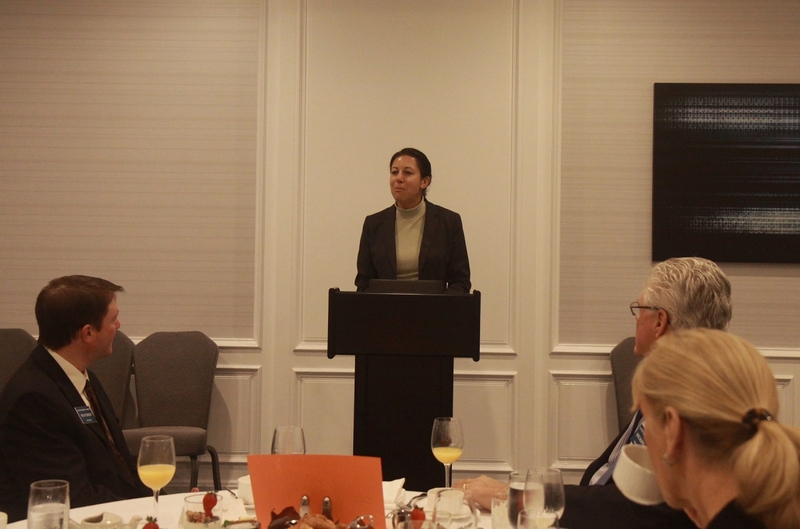 (March 6, 2015) The potential for changed relations with Cuba to open economic and trade opportunities for U.S. and California companies was the subject of a lively talk at the recent breakfast forum of the California Chamber of Commerce Council for International Trade. 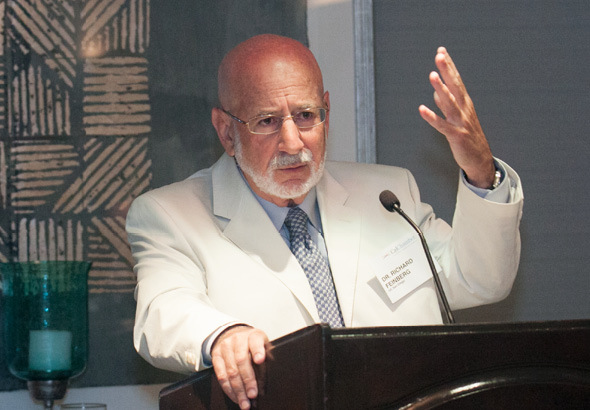 Dr. Richard E. Feinberg, professor of international political economy at the University of California, San Diego School of International Relations and Pacific Studies, shared his expertise on the history of U.S.-Cuba relations with members of the council at the March 6 forum scheduled in conjunction with the quarterly CalChamber Board events in Santa Monica. 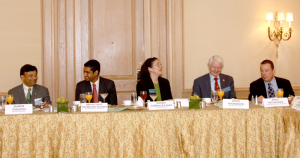 (December 5, 2014) The importance of trade agreements and their impact on U.S. jobs was the focus of a recent international breakfast hosted by the California Chamber of Commerce. Nearly 40 CalChamber Board members attended the December 5 breakfast to hear Ambassador Islam Siddiqui, senior advisor, global food security at the Center for Strategic and International Studies, and Brian Peck, deputy director of international affairs at the Governor’s Office of Business and Economic Development (GO-Biz). (September 5, 2014) A fact-filled look at the many connections between Canada, the United States and California was the focus of a recent breakfast gathering hosted by the California Chamber of Commerce Council for International Trade. 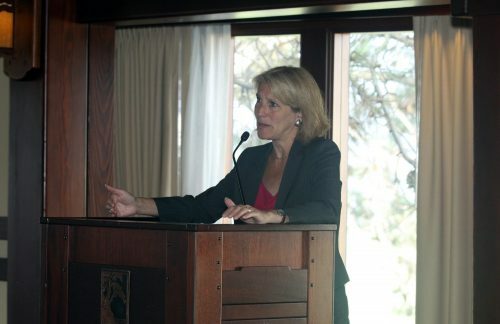 Consul General Cassie Doyle, Canada’s senior representative for Northern California, Nevada, Hawaii and Guam, emphasized that bilateral trade between Canada and the United States is the largest in the world, with more than $2 billion in goods and services crossing the border each day for a total of $735 billion in 2013. 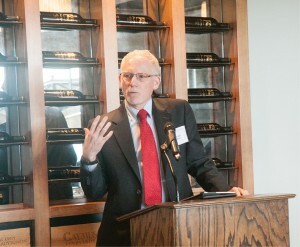 More information about the Canada-California trade and investment relationship is available at calchamber.com/canada. 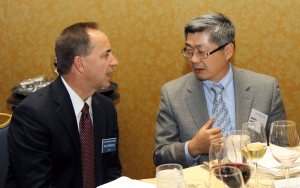 (September 17, 2013) As China’s phenomenal economic growth of the last three decades is slowing, Chinese leaders are committing to a new round of reforms, a University of California, San Diego expert recently explained to a California Chamber of Commerce audience. Market-oriented economic reform is one of three possibly contradictory priorities for the president of China, Barry J. Naughton, UC San Diego professor of Chinese economy and chair of Chinese international affairs, said at a CalChamber international trade breakfast on September 13. 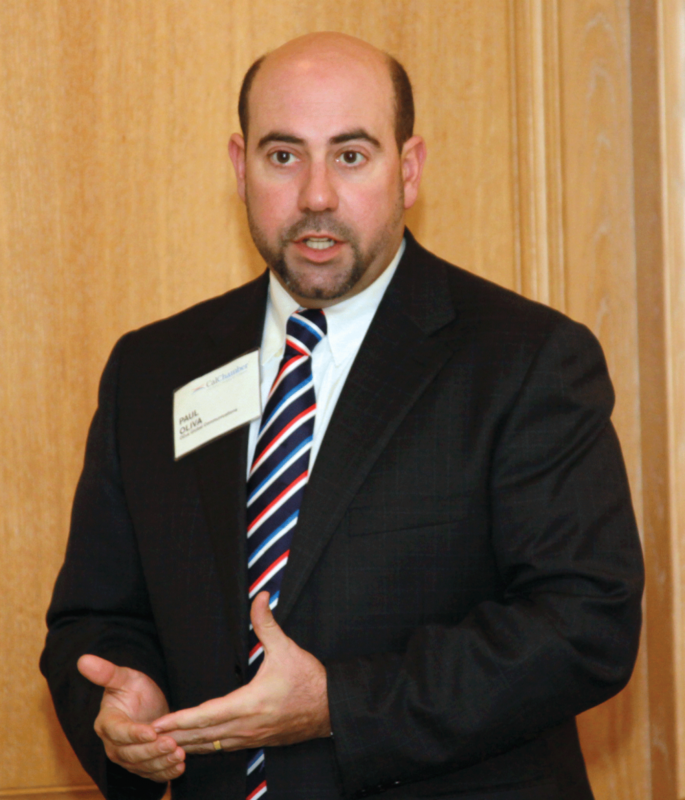 (May 21, 2013) Michael Masserman of the U.S. Department of Commerce discusses the National Export Initiative at the May 21 international forum. 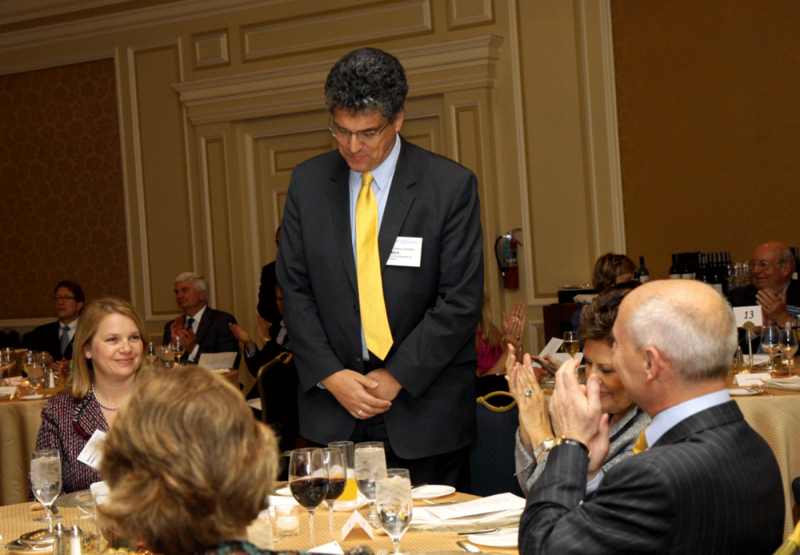 At right is Kish Rajan, director of the Governor’s Office of Business and Economic Development (GO-Biz). 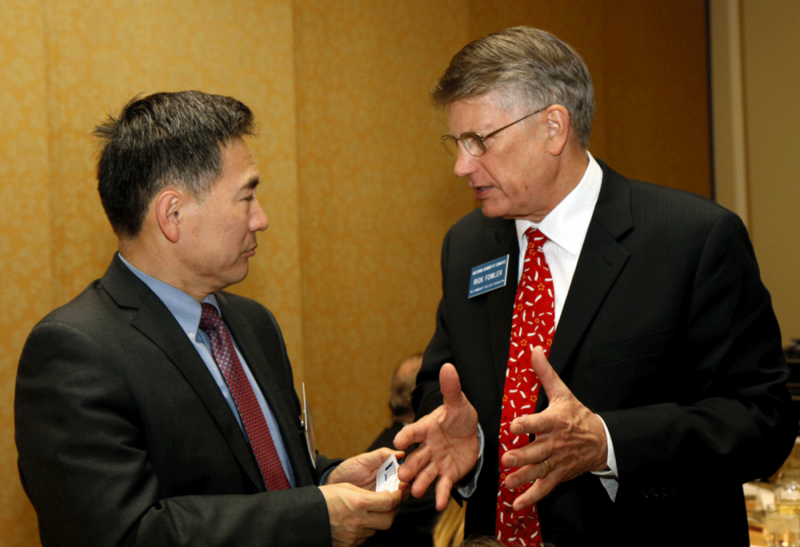 (March 8, 2013) Dr. N. Bruce Pickering, executive director of the Asia Society, Northern California, gives a sweeping overview of Asian history and how it affects trade relations of Asian economies with the United States and California at an international breakfast presented by the CalChamber Council for International Trade (CCIT) on March 8. From left are CalChamber Chair Fritz Hitchcock, Hitchcock Automotive Resources; Pickering; CCIT Chair Susan Corrales-Diaz, Systems Integrated; and CCIT Vice Chair Mark Jansen, Blue Diamond Growers. 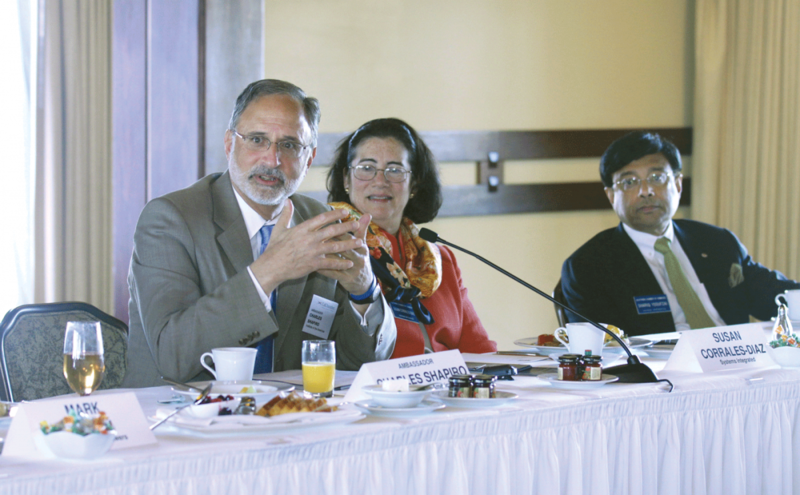 (May 21, 2012) Michael Rossi (left), senior adviser for jobs and business development, Office of the Governor, answers questions at a May 21 forum hosted by the CalChamber Council for International Trade, chaired by Susan Corrales-Diaz (right). 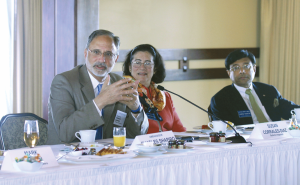 Michael Rossi (left), senior adviser for jobs and business development, Office of the Governor, answers questions at forum hosted by the CalChamber Council for International Trade, chaired by Susan Corrales-Diaz (right). 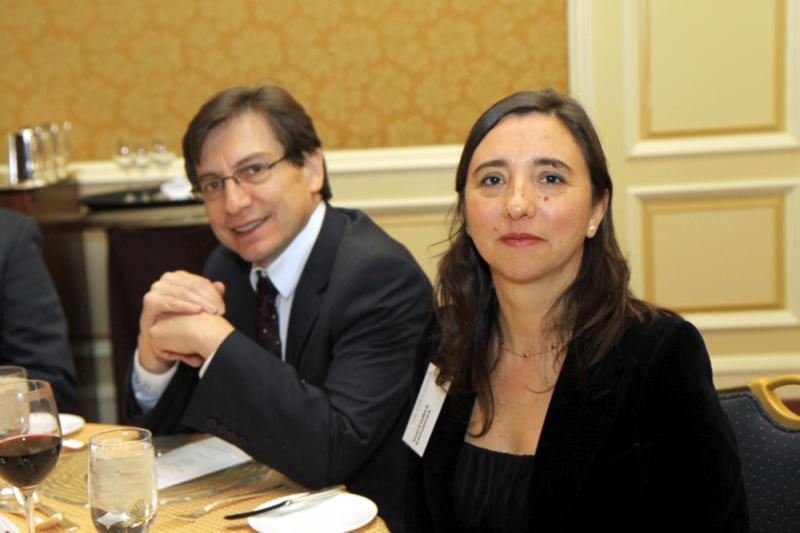 (April 12, 2012) Chilean Ambassador to the United States Felipe Bulnes will speak today on California and U.S.-Chilean trade relations at the California Chamber of Commerce International Luncheon Forum. Also attending the forum will be Ambassador Gabriel Rodriguez of the Ministry of Foreign Affairs in Chile; Consul General of Chile in San Francisco, Rolando Ortega; Rodrigo Ballivian, general manager of the American Chamber of Commerce in Chile; Agustin Hunees, president of the Chile-California Council; and Cristobal Barros, executive secretary of the Chile-California Council. 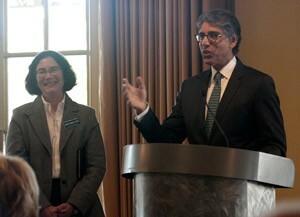 Ambassador Bulnes (left) greeting CalChamber President CEO Allan Zaremberg. (March 30, 2012) U.S. 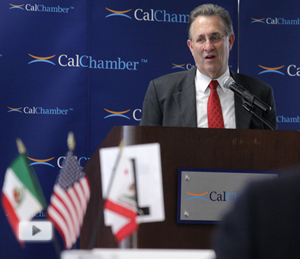 Ambassador to Mexico E. Anthony Wayne discusses the importance of a strong trade relationship with Mexico at the California Chamber of Commerce International Breakfast forum. 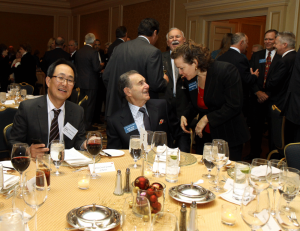 (December 1, 2011) The CalChamber Board of Directors hosted representatives of major California trading partners at the quarterly dinner in San Francisco. 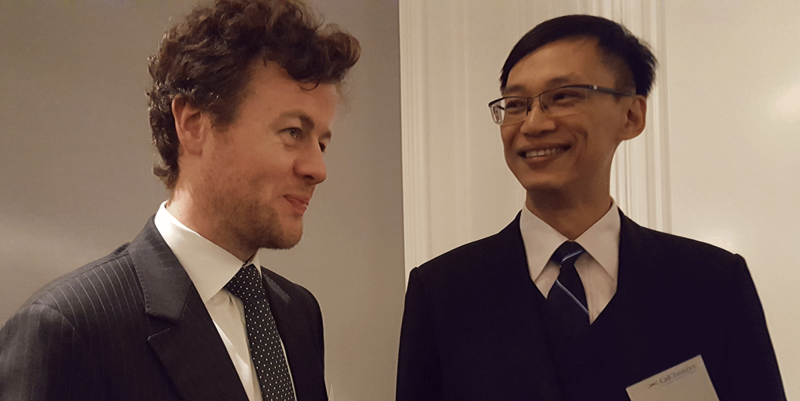 Not pictured, but also in attendance were Canadian Consul General Cassie Doyle and Hong Kong Investment Director Lawrence Tang. 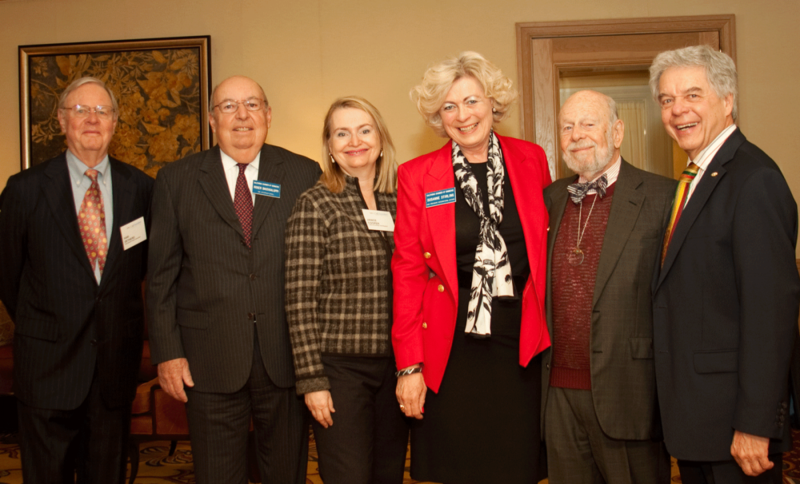 (September 9, 2011) During the September CalChamber Board of Directors meeting, the Council for International Trade held it’s semi-annual breakfast forum, featuring Dean Peter Cowhey. 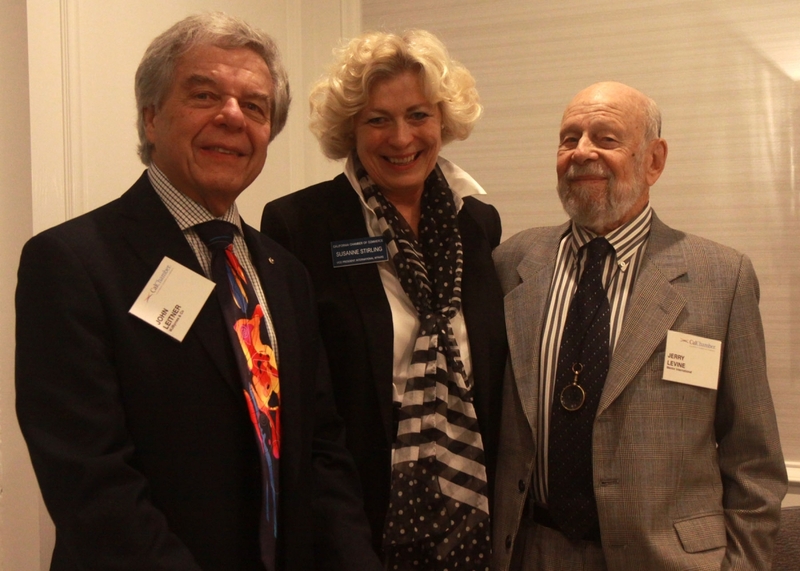 Dr. Cowhey spoke on the three pending free trade agreements and answered questions about how trade policy impacts California businesses. (June 1, 2011) On June 1 and 2, the California Chamber of Commerce hosted several events in Sacramento for the California buisness and international communities. 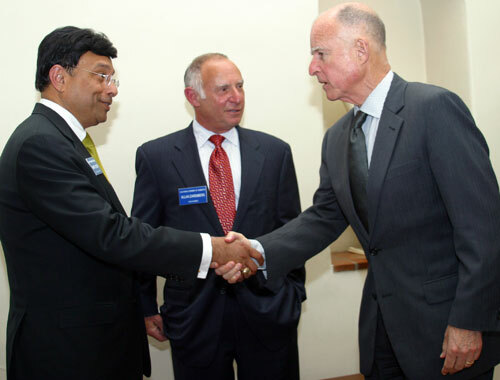 Pictured left to right: S. Shariq Yosufzai, 2011 Chair – CalChamber Board of Directors, Allan Zaremberg, President and CEO – CalChamber, and California Governor Jerry Brown. 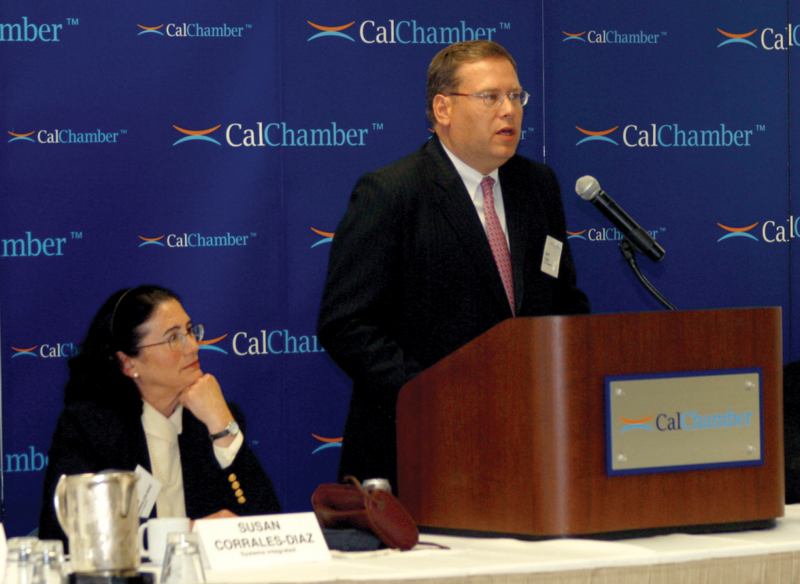 (June 1, 2011) Ambassador Kurt Tong discusses upcoming meetings of the Asia-Pacific Economic Cooperation (APEC) at an international forum presented by the CalChamber Council for International Trade, chaired by Susan Corrales- Diaz (left). At right is Gary J. Goldberg, council vice chair. (March 10, 2011) E.U. 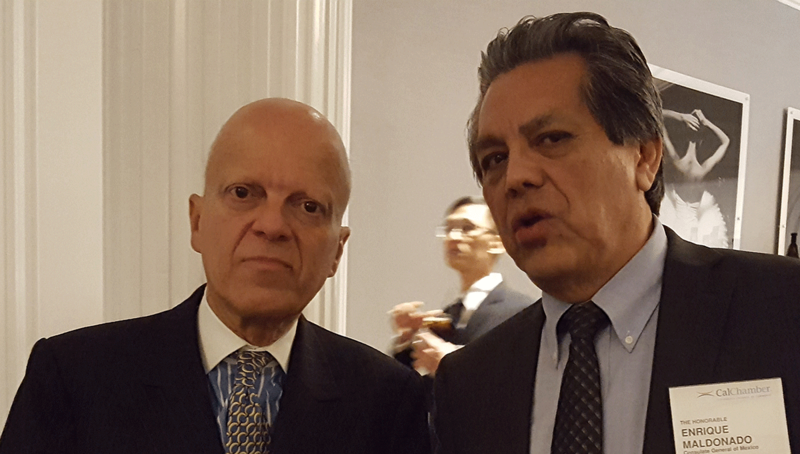 Ambassador to the United States João Vale de Almeida presented his perspectives on E.U. 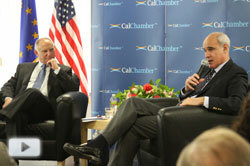 relations with the U.S. in response to questions from CalChamber President and CEO Allan Zaremberg and other audience members at the CalChamber-hosted International Luncheon Forum. 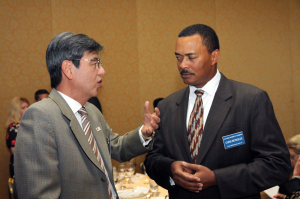 (September 8, 2010) Final approval of the U.S.-Korea Free Trade Agreement (FTA) will create American jobs, His Excellency Duk-Soo Han, ambassador to the United States from the Republic of Korea, told a California Chamber of Commerce gathering last week. (May 17, 2010) Ambassador Demetrios Marantis, deputy U.S. Trade Representative (at podium), gives an overview of Asia Pacific Economic Cooperation (APEC) issues at the May 17 International Forum presented by the CalChamber Council for International Trade, chaired by Susan Corrales-Diaz (second from right). Other speakers were Joel Ayala (left), executive director of the newly created Governor’s Office of Economic Development (GoED); and Suresh Kumar, Assistant Secretary for trade promotion, U.S. Department of Commerce, who spoke on the President’s National Export Initiative. (March 11, 2010) Dr. Gordon Hanson (center), director of the Center on Pacific Economies and economics professor at the University of California, San Diego, comments on trade policies of the Obama Administration and some of the related politics at the March 12 International Breakfast Forum of the CalChamber Council for International Trade, chaired by Susan Corrales-Diaz (right). At left is CalChamber Chair Larree Renda. 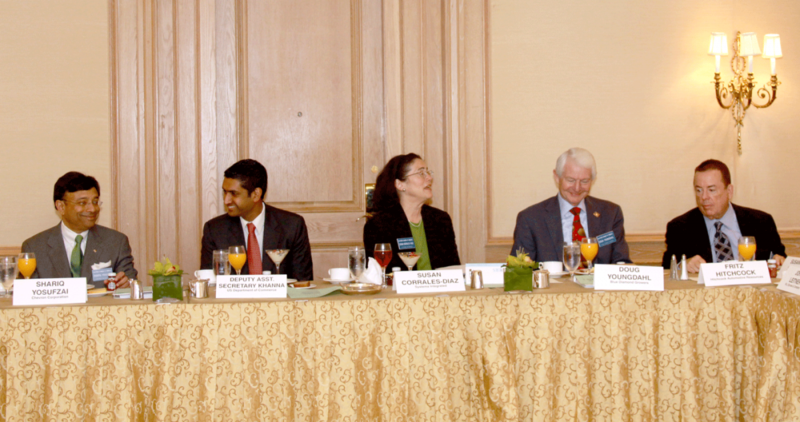 (December 4, 2009) Ro Khanna (center), deputy assistant secretary, U.S. Department of Commerce, chats with Frank Washington, CEO of Moon Shot Communications, and Susan Corrales-Diaz, chair of the CalChamber Council for International Trade and president / CEO of Systems Integrated, at the CalChamber CIT meeting in San Francisco. 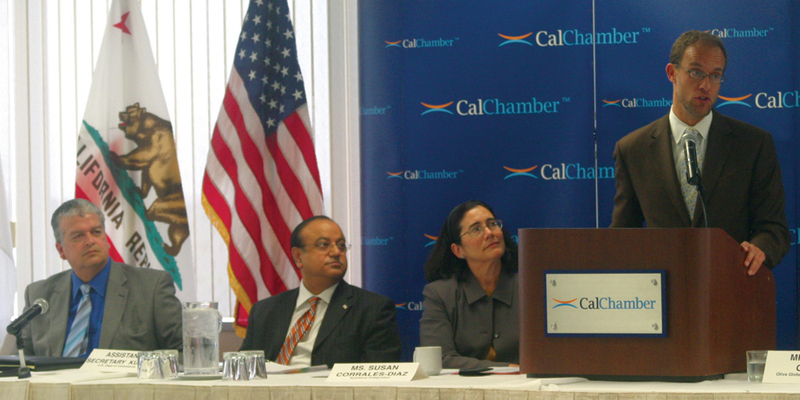 Khanna discussed U.S. Department of Commerce trade priorities, including business visa and export controls reform, intellectual property protection, intergovernmental cooperation and trade promotion, which will help U.S. companies increase exports while setting the country on a path to long-term, sustainable growth that creates jobs here at home. 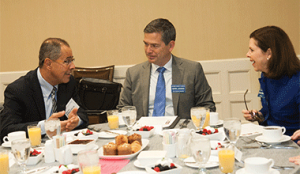 (September 11, 2009) Providing a federal outlook on prospects for approval of free trade agreements at the CalChamber International Breakfast Forum is Carlos Gutierrez (left), former secretary of commerce for President George W. Bush, former chairman and chief executive officer of the Kellogg Company, and now senior advisor to the U.S. Chamber of Commerce. 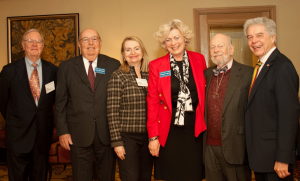 At right is CCIT Vice Chair Doug Youngdahl. 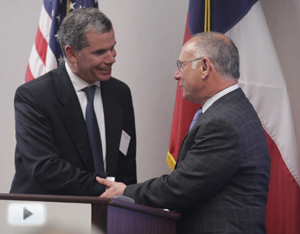 (May 18, 2009) Stephen P. Jacobs (left), acting assistant secretary of the International Trade Administration in the U.S. Department of Commerce, outlined the trade trategies, policies and priorities of the Obama administration to more than 70 guests at a May 18 forum presented by the CalChamber Council for International Trade. 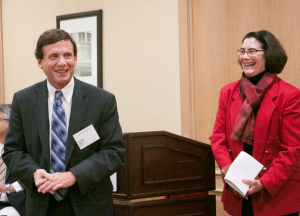 Attendees included CalChamber Board members Susan Corrales-Diaz (center), council chair, and Roger Baccigaluppi. (September 5, 2008) Patricia Haslach (left), U.S. ambassador to the Asia-Pacific Economic Cooperation (APEC), gives an update on international trade issues and prospects in the region at a gathering of the California Chamber of Commerce Council for International Trade, chaired by Susan Corrales-Diaz (right). Paul Oliva, principal with Oliva Global Communications and a member of the CalChamber Council for International Trade, talks about the potential for California to host the 2011 meeting of the Asia-Pacific Economic Cooperation. 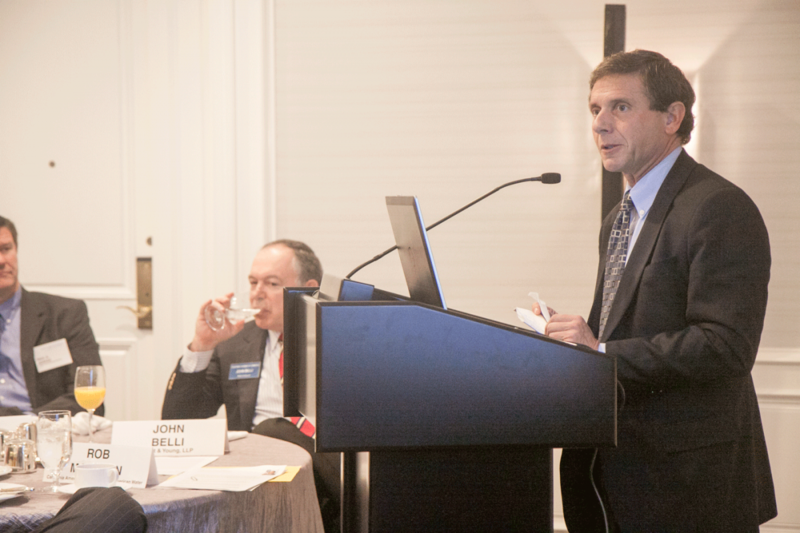 Garrett Ashley (center), California undersecretary for international trade at the state Business, Transportation and Housing Agency, discusses the state’s International Trade and Investment Study. 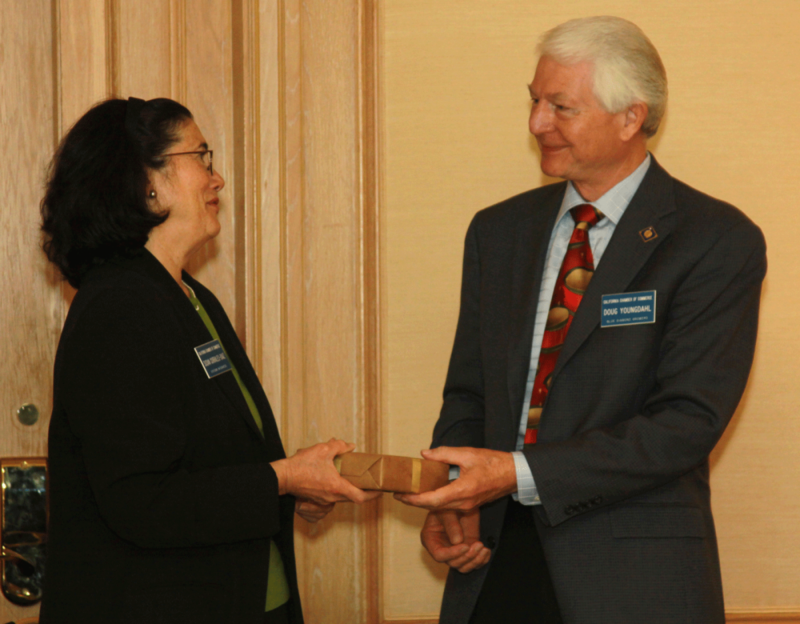 At left is Susan Corrales-Diaz, chair of the CalChamber Council for International Trade; at right is council vice chair Doug Youngdahl. Under Secretary Ashley’s successor will be Brain McGowan, deputy secretary for economic development at BTH. 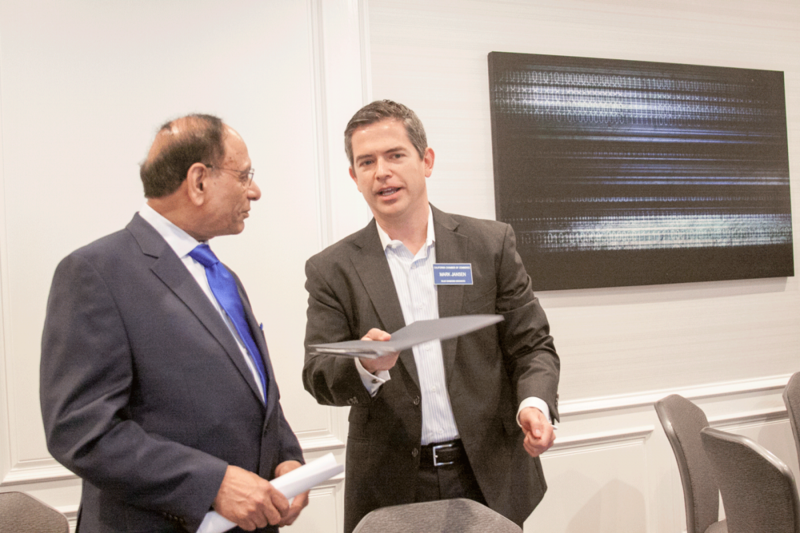 McGowan has a team that looks forward to incorporating international trade into its portfolio. The team has indicated a real interest and understanding of international trade and is anxious to continue to move the issue forward. 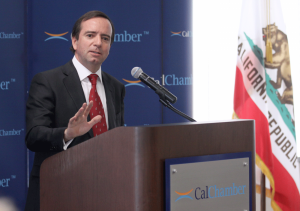 Here is a link to an “open” letter sent to Under Secretary Garrett Ashley as a means of expressing CalChamber CIT support for continuing the state’s activities in the international arena.